Happy Tuesday everyone! I'm all excited today as I only have 2 days left of work before having a week off. Woo-hoo! I'm scheduling in some crafting, some clothes shopping, some eating, some crafting, some craft shopping and some more eating.... You get the idea! Today I've got a wonderful Whimsy image to share with you! Our stupendously talented illustrator, Crissy Armstrong, has excelled herself again with this gorgeously clever carousel horse. Don't you just love the way the little foal nestles in against her Mum? Too cute! I've realised lately that I am ridiculously predictable with colour. I always go for pinks and greens and yellows and turquoises..... Note to self: be more adventurous with colour! Stamps: Proud Mamma by Whimsy Stamps. Copic Colours: C1, C3, C5, C7, E31, E33, E35, E37, R81, R83, R85, YG03, YG63, YG67, Y17, Y21. Tools & Embellishments: Card candy. Although you can't see it from this picture, there is actually glitter on the white frilly bit around the saddle. And I used some sparkly Core'dinations Gemstone cardstock too. I went for colour scheme rather than edible stuff, obviously! I hope everyone is enjoying the week and that you are all looking forward to that fabulous bank holiday weekend! Your colouring is stunning Stacey! Beautiful Stacey, WOW this is wonderful!!! Your coloring is fabulous! WOW! This really is a stunning card Stacey and your colouring rocks! A really pretty Spring card,stunning image. Thanks for playing with Charisma this week. Oh My! So super gorgeous! Just stop'n by to say hello and tell you that I love your Mare and Foal card! So super gorgeous! Hop on ver and enter in my cnady give away! I will send anywhere! 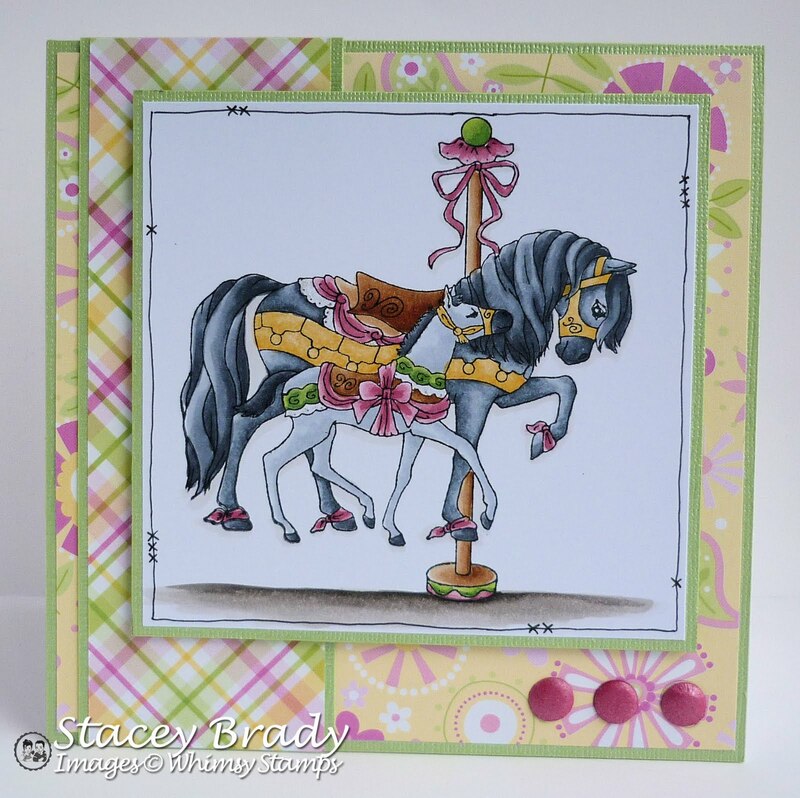 Oh what a sweetie, gorgeous work with the image and a wonderful card Stacey. Well Stacey... I LOVE your card and the colors you've used. Predictable or not, they work!! Thanks so much for joining us for the Stamp Something challenge. A simply stunning card - I love your colour scheme too. Thanks for joining in at OSCC.